New Delhi, April 14: The Aam Aadmi Party (AAM) has not given up on alliance with the Congress party for the Lok Sabha Elections 2019, said Delhi chief minister Arvind Kejriwal. AAP chief and Delhi CM Arvind Kejriwal reportedly said that his party's aim is to defeat the duo of Narendra Modi and Amit Shah, and for that his party is still hopeful for alliance with the Congress party. AAP-Congress Alliance Talks Fail, Both Parties to Go Solo in Delhi. 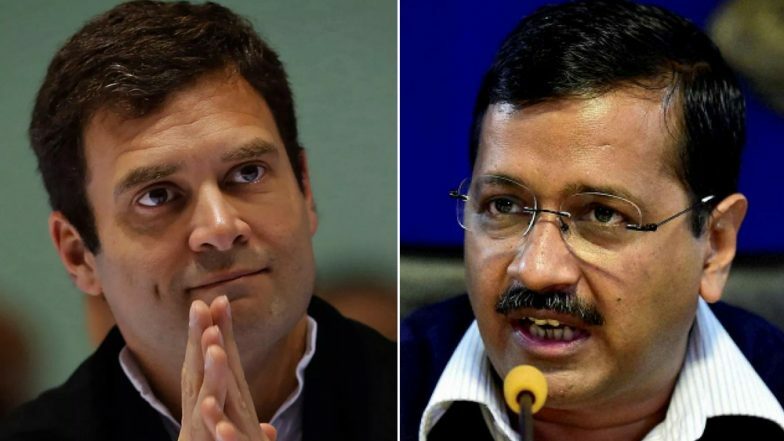 Kejriwal's comments comes a day after AAP said that they were open to alliance with the Congress in 18 seats in Delhi, Haryana and Chandigarh for Lok Sabha Elections 2019. But the Congress is still firm on its decision to alliance with AAP only in Delhi. Lok Sabha Elections 2019: AAP Joins Hands With JJP in Haryana After Talks Fail With Congress. The AAP-Congress alliance talks have now spanned for more than two months, but which no final conclusion. The suspense over the alliance continues even as leaders from both the parties have rejected the prospect. Reports say that Delhi deputy CM Manish Sisodia is in favour of the alliance and is still trying to stitch together an alliance.